Today a brand new PADI IDC Staff Instructor course started on Phuket, Thailand with Sam in conjunction with PADI CDC Center ‘Dive Asia’. Ideally I can start a PADI IDCS course a day before the start of the PADI IDC, since we can cover a lot of ground allowing us to meet performance requirements in a more relaxed way. Sam is also my seventh PADI IDCS Instructor candidate this year, bringing the total tally of PADI IDCS Instructors I trained to 45. 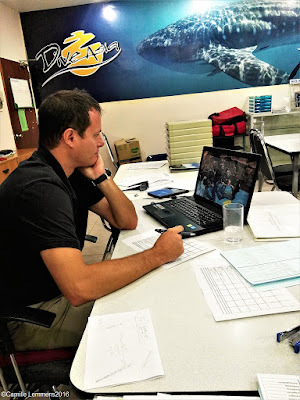 PADI IDC Staff Instructor course started on Phuket, Thailand; Sam during his evaluation training, watching some PADI videos and get the hang of how to evaluate PADI IDC candidates in the classroom and during confined- and open water dives. Tomorrow we start the online IDC presentations with two candidates and on Friday we start the actual PADI IDC with an additional candidate. After having mastered the theory exams, IDC Staff course related power point presentations and watched the evaluation videos, there are still a few more performance requirements that Sam needs to meet, like completing a PADI skill circuit, presenting a knowledge Development or classroom presentation and a confined water presentation. For each section he also needs to get slightly higher passing grades compared to the IDC candidates. The pressure is on! More to follow later, on Sam’s PADI IDC Staff Instructor course and on the progress of the PADI IDC candidates during their program. Stay tunes! In the meantime, if you’re interested in participating in a PADI IDC Staff Instructor course or a PADI IDC program, your next opportunities will be the last PADI IDC in Thailand and possibly in all of South East Asia, scheduled to start 9th December on Koh Phangan, Thailand in conjunction with PADI 5* IDC Center ‘Haad Yao Divers’, this is followed by the first PADI IDC in 2017 which is scheduled to start 10th January on Phuket, Thailand in conjunction with PADI CDC Center ‘Dive Asia’ and this is followed by a PADI IDC that falls completely in the Chinese New Year holiday period, scheduled to start 26th January on Koh Lanta, Thailand in conjunction with PADI 5* IDC Center ‘Blue Planet Divers’.